August | 2007 | Why Run? Although I’ve been focusing on shorter races this year, I couldn’t pass up the chance to run a trail marathon in my backyard! 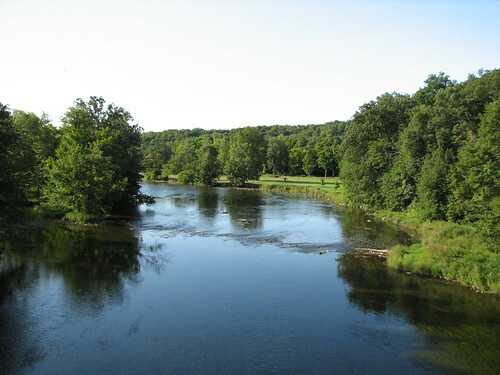 The Fallsburg Marathon uses the same roads and trails that I train on, including the two covered bridges of my “explore the countryside” trek in April. In fact that countryside 16-miler was my longest run of the year until two weeks ago when I decided I better gauge my fitness for the marathon by doing another 16 mile run. 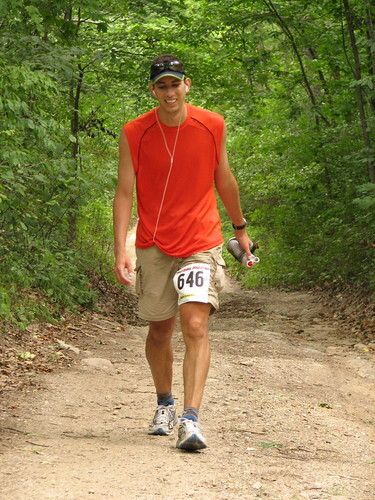 I decided I was fit enough to finish a trail marathon, but definitely not with a fast time – I estimated a finish time of between 5 and 6 hours. 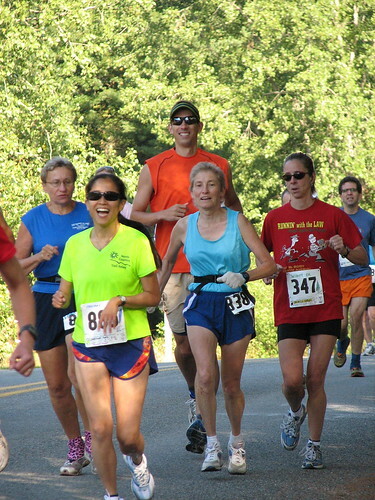 Runners feeling fresh and having fun at the start of the Fallsburg Marathon. The weather couldn’t have been better! It was sunny and 55 degrees at the start, warming to an overcast 70 degrees later in the afternoon. 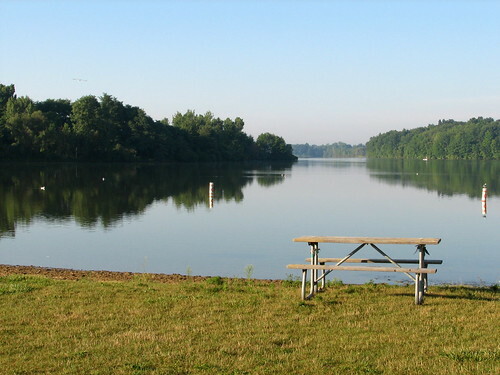 The Fallsburg Marathon started and finished at Fallasburg Park (yes, they’re spelled differently and no, I don’t know why!) It was a rather small event despite offering three race distances – marathon, half-marathon, and an 8K with about 20-40 runners in each event – but nobody was complaining about the low turnout. In fact, I thought it was more enjoyable with its laid-back and extra-friendly atmosphere. Most runners were local and I was probably the most local of them all, but a few runners were from out of state – I met representatives of Wisconsin, Kansas, and even California! 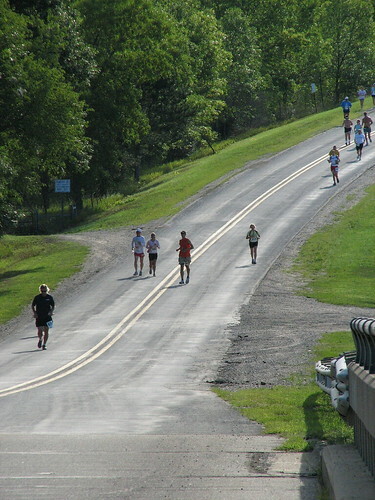 Crossing the Flat River – the field in the background was the home stretch before the finish. The SWAG was pretty sweet, too – as a full marathon runner I received a t-shirt, a hooded pullover sweatshirt, and instead of a traditional finisher’s medal I was handed a bath towel printed with the words “Fallsburg Marathon Finisher” – very cool! The 8K race was dubbed the “Wimpy” to poke fun at the runners who declined to go 13.1 or 26.2 but the 8K’ers got the coolest t-shirt, featuring Wimpy from the Popeye cartoons. 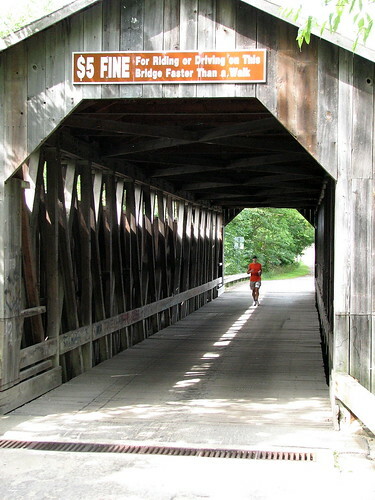 Crossing the Fallasburg Covered Bridge – this was the second loop, thus no other runners nearby. 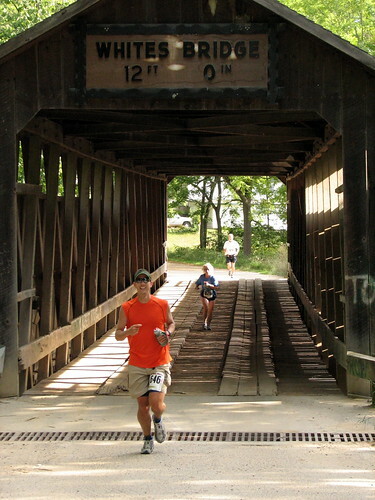 Within the first 1/4 mile all racers found themselves crossing the Fallasburg Covered Bridge and then staring at a long climb on the paved road. At mile 2.5 was the first aid station which also served as the turn-around for the 8K runners – for them it was almost all uphill for the first half and then downhill on the return. It wasn’t until mile 4 that pavement gave way to dirt road for the next three miles. 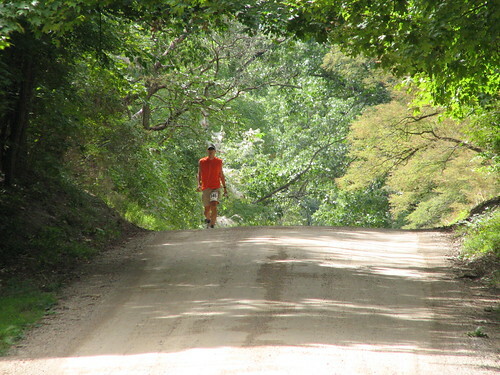 Descending a long hill enroute to crossing the Flat River. This dirt road section was quite flat until just after crossing White’s Covered Bridge, where a towering hill loomed in front of us. 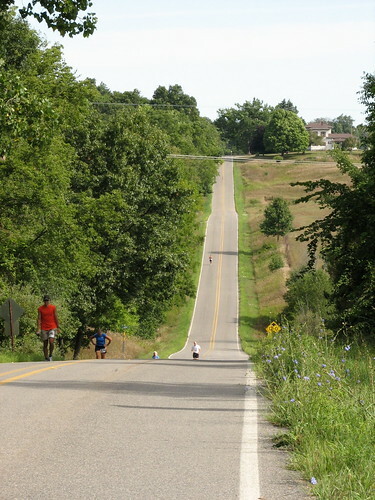 I chose to walk up it and was able to keep pace with most of those were maintained a running stride. Crossing the White’s Covered Bridge just before tackling a major climb. The unusually large rolling hills of rural west Michigan! Finally after 8+ miles of running we finally turned off-road onto the trails! I had maintained a very constant 10:00 pace over the first 7 miles and it started slipping to an 11:00 pace by mile 10, which I held through the trail section and into the start/finish where I crossed the 13.1 mile mark in 2:19, good for a 10:37 first half pace. That was about what I expected; however what I hadn’t expected was that my heart rate was about 150-160 during that time. I should’ve been at 150 or below, ideally 140, at such a slow pace; in fact I’ve done some training runs at a 9:00 pace where I maintained a 150 HR, so I was a bit concerned. 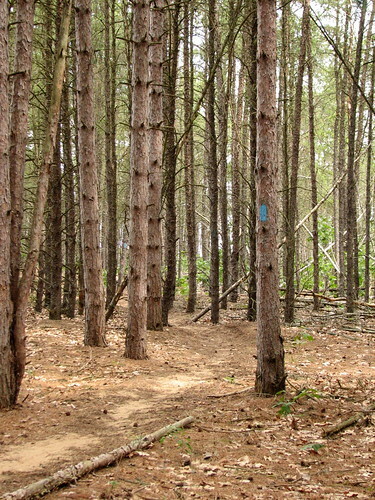 An example of the beautiful trails that were part of the marathon course. The concern was apparent at mile 14 when Amanda did a video interview of me running while she drove alongside in the car. I can be heard saying “I’m kinda tired” after warning Amanda to watch out for the mailbox that she almost hit! Filming and driving simultaneously can be difficult! Amanda had a busy day herself as she met me on the course at least a dozen times to snap some photos and even serve as my support crew when necessary. 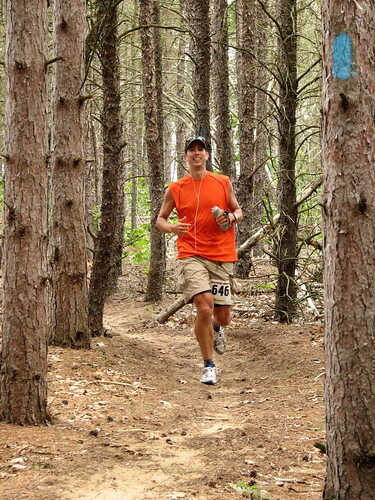 Cruising along the North Country Trail about three hours into the race. Just before mile 15 I hit the trails again, this time the section North Country Trail that I’ve run dozens of times in the past, especially with my dogs. It would’ve been fun to have had the dogs to keep me company but as it was, the next three miles went by rather quickly thanks to my familiarity with the trail. I was definitely slower, keeping an 11:00-12:00 pace (by running a 10:00 pace and taking occasional walking breaks) through mile 18. Walking for a bit to recover some energy for the stomach and the legs. However, I was feeling very fatigued so I decided to walk the entire mile between 18 and 19 – it helped, but not as much as I’d hoped and I was beginning to really struggle. I ran a bit after mile 19 but my stomach felt nauseous and my legs were extremely painful, probably due to the swelling of being on my feet for so long. I staggered for a couple miles and saw my hopes of a sub-5:00 marathon disappear, and soon again a 5:15 finish became unrealistic. Miles 21-23 were the worst as I was unable to drink much and my legs began to stiffen up. Feeling pretty crappy as I shuffle along. Around mile 24 I decided on another extended recovery walk and this time it did wonders for me! I jogged down that very first hill I’d climbed some five hours earlier and before embarking on the last 1.2 miles of trail, I was greeted by some barking – Haven and Beacon! During our earlier rendez-vous Amanda and I arranged for her to pick up the dogs and when I met Amanda at mile 25 I traded my water bottle for a leash that had Haven attached to it! 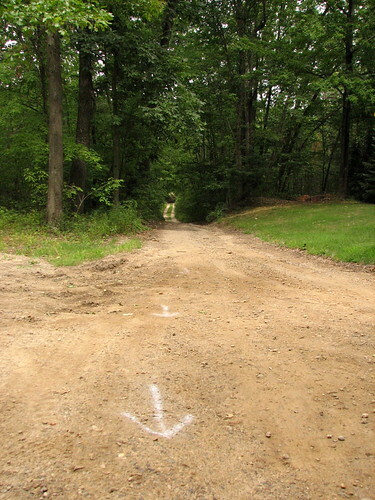 The volunteers did a great job marking the trail with chalk dust. Excitedly she dragged me down the trail and her “assistance” felt pretty good! As soon as we were far enough from the road I let her off leash to go sprint the trails and wade in the river. I’d recovered enough to maintain a 10:00 pace over the last 1.2 miles and even managed to pass a runner in the last half mile. 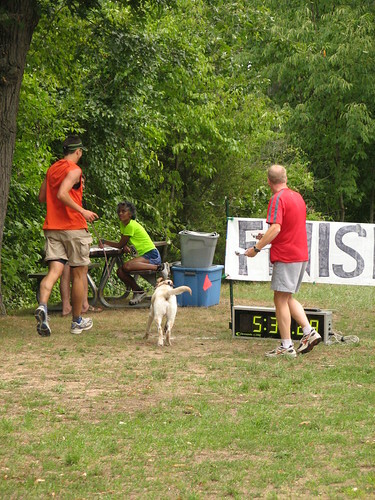 I put Haven back on the leash – she may have towed me the first time, but I had to do the pulling across the finish line as Haven tried to socialize with spectators, Amanda and Beacon among them. We crossed the line in 5:31, “good” for 19th out of 22 marathon runners. At least I wasn’t last! Crossing the finish line with Haven in tow! Boy was I worn out but there was still plenty of food left – it reminded me of a picnic, with hot dogs, grilled chicken, watermelon, pop, water, popsicles and even a cake! I chilled for a while with Amanda and the dogs, snacking on some of the grub and thanking the race director and the volunteers. What a fun day! I was really looking forward to spending the rest of the evening on the sofa! It felt great to get an epic long run under my belt for this year. Clearly I was under-trained but I knew that going in; however, I was surprised at the effect. I’m not sure why my heart rate was so high, but my stomach and legs weren’t used to having to function for so long under so much stress, and that’s just what a long run is supposed to prepare you for. #27 – Are You Wearing Running Genes? If you hang around runners and other endurance athletes, sooner or later you’ll hear them talk about “VO2 max”. No, this isn’t what the space shuttle uses for fuel! In a nutshell, VO2 max is a measure of how well your body delivers oxygen to your muscles during prolonged exertion, and thus it’s a good barometer of your endurance capability. I won’t try to explain the science behind it all when someone with an advanced degree can tell you what VO2 max means to runners. A sedentary person will range between 20 and 50 for their VO2 max with an average of 35. In other words, an untrained couch potato can hop off the sofa and test out to the above VO2 max scores. Does this mean that my 46.7 puts me near the top of that range? Not at all! The sedentary VO2 max essentially is your genetic base, a base upon which you can improve with training. VO2 max performance will improve with training – since I’ve been running for almost four years now, I should be well above my base. How far? 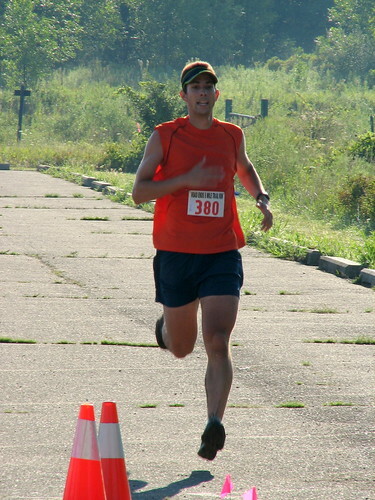 January 1, 2004 was my first run since the fall of 1999 and I was well out of shape. I managed to last for 13 minutes, covering just 1.25 miles. According to the calculator my VO2 max was 26.5, although such a short distance doesn’t allow for as much accuracy as a longer run. Still, it shows that my base is quite low! After all my “in shape” score of 46.7 is below what some people can apparently do without even training. Hopefully with further training I can continue to push my upper limit. Speaking of upper limits, elite athletes can boast some pretty amazing VO2 max scores. The highest ever recorded seems to be a 94 by Bjorn Daehlie, the Norwegian cross-country skier who was almost unbeatable in his prime. Greg LeMond reportedly scored 92.5 and skyrunner Matt Carpenter notched a 90.2 (although he claims that he may have scored a 94.9). You certainly don’t need to score in the 90’s to be competitive; in fact many champion athletes have scores in the 80’s and even 70’s, such as Steve Prefontaine (84.4), Lance Armstrong (83.8), and Frank Shorter (71.3). Notably none of those elite athletes scored below 50, so I’m not about to earn a living by winning races! If I want to run faster, though, it’ll help to improve my VO2 max as much as I can. The way to do that is to train at or near that limit, which is why runners and coaches recommend interval training – run hard for a minute or few, recover for a bit, then repeat several times. You can’t do this all the time or your body would wear out, but this type of training is what moves your VO2 max upwards. Other aspects also affect endurance – such as lactate threshold and efficient stride mechanics – so VO2 max isn’t the single defining marker for speed over long distances. But it sure helps! You are currently browsing the Why Run? blog archives for August, 2007.